It's Super Bowl Sunday and my nephew's have requested something sweet for the party my brother and sister-in-law are hosting, so I made Reese's Pieces Cupcakes. You can't go wrong with the combination of chocolate and peanut butter! Preheat oven to 350 degrees and line two cupcake pans with baking cups. I use brown baking cups from Simply Caked. Blend cake mix, eggs, oil and buttermilk at low speed for about 30 seconds. Fill baking cups 2/3 full. Bake 18-20 minutes or until inserted toothpick comes out clean. Cream together peanut butter and butter in a stand mixer. Beat on medium-low speed to combine. Add the remaining ingredients and combine again. Beat on high for 2-3 minutes until frosting is light and fluffy. Add more milk if desired to get your desired spreading or piping consistency. Frost cooled cupcakes. I use a Wilton 1 M tip. Place Hershey's Hot Fudge Sauce in a small glass bowl for about 20 seconds. Pour into a Wilton Squeze bottle and let it cool for about 5 minutes. 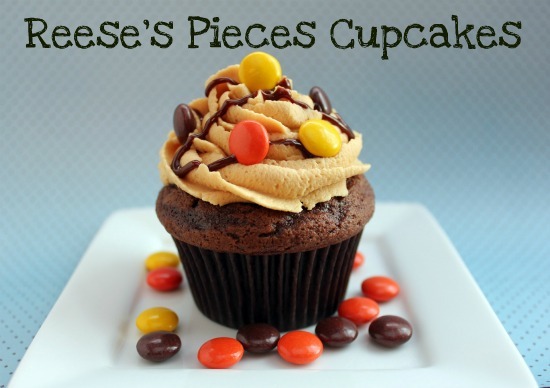 Drizzle chocolate sauce over cupcakes and garnish with Reese's Pieces candy. Perfect. Peanut butter and chocolate should get married! Oooh, yum! My last PB icing recipe was too dry. Can't wait to try this one! And, I agree with you both...nothing beats chocolate and peanut butter! Remind me to invite you to my next party ;) They look SO good. What decorating tip do you use to get the frosting like that? I love it! Thanks Jemm! I used a Wilton 1M tip. You can usually find them at Michael's. Waaaaaay YUMMY!! And I loooove that you used a Duncan Hines box mix too :) I generally cheap on the cake part too....for me it's all about the frosting... Thanks for sharing! PB and Chocolate is the best combo evah!! And I LOVE recipes that start with a box and get doctored up.... SO great to have those on busy days.... These look amazing! Oh my gosh I love reeses anyhing, these are calling my name! Yummy!! Love me some Reese's!